A quintessential New Mexico dish. Slow roasted pork marinated in T’s red chile served with refritos, papitas, tortilla & house salad. Torres Family recipe. Two chile rellenos with refritos, arroz, house salad & two sopaipillas. Skirt steak or chicken breast specially marinated then grilled served with refritos, guacamole, sour cream, pico de gallo & two flour tortillas. Blue corn tortilla, red chile carne adovada, papitas, two eggs over-medium smothered in chile, cheddar-jack cheeses piled high in a bowl with two sopaipillas. Cheese enchilada smothered in T’s chile, cheddar-jack cheeses, our famous chile relleno, crispy ground beef taco, refritos, arroz & two sopaipillas. Teofilo’s red chile pork tamale, one rolled cheese enchilada, crispy ground beef taco, refritos, arroz & two sopaipillas. One rolled cheese enchilada smothered in T’s chile, cheddar-jack cheeses, bean tostada, crispy beef taco & two sopaipillas. 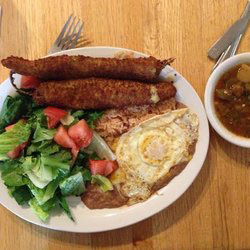 Teofilo’s proudly uses local New Mexican ingredients prepared fresh daily.